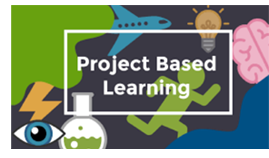 MIT BLOSSOMS is moving in a new direction, to provide high school teachers with the resources they will need to feel comfortable and confident in giving Project-based Learning (PBL) a try. Polls show that many teachers would like to use PBL as a way to truly engage their students and teach them 21st Century skills. However, most teachers are hesitant to try PBL since it’s not how they were taught and also because they don’t have the tools or training to get started. BLOSSOMS will develop “ready-made” packages that provide teachers with all the resources and guidance they will need to work on a 3-4 week project with their students. Current and specifically designed new BLOSSOMS video lessons will serve as the jumping off points to longer-term projects. These projects will allow students to explore the academic content further while tackling real world problems in a learning environment that encourages sustained inquiry, group collaboration and self-management. A final element of the BLOSSOMS PBL lesson packages will enable teachers and students around the world to share their PBL research, findings and final products with students in other countries – students working from the same BLOSSOMS kick-off video lesson.The TPL packages will provide teachers and students with access to a Global Education platform, enabling such communication. For updates on this initiative, visit the MIT BLOSSOMS website or follow us on Facebook or Twitter. BLOSSOMS has received funding to develop five Blended Teacher Professional Learning (TPL) modules that can be used by districts and schools in states across the country that have signed on to the Next Generation Science Standards (NGSS). Many teachers we have met in these states agree that the new standards will greatly improve overall science education. Unfortunately, they also believe that they have not received adequate training to incoorporate these standards into their lessons. The BLOSSOMS Blended Teacher Professional Learning model is designed to be a highly scaleable solution to this growing training need - providing an easily accessible online package of videos and accompanying guides and resources that will enable education leaders across the country to organize teacher workshops on NGSS implementation. 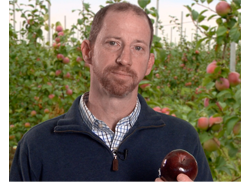 The five new BLOSSOMS NGSS-aligned video lessons will be in the topic areas of Biology, Chemistry, Physics, Earth Science and Engineering. To the right you can read about the first new video lesson of this initiative—"Hanging by a Thread", a physics lesson. Each of these five videos will serve as the anchor event of a domain-related Blended TPL NGSS workshop. Participating teachers will experience the lessons just as their students would, allowing them to understand firsthand the pedagogical shifts required by NGSS. 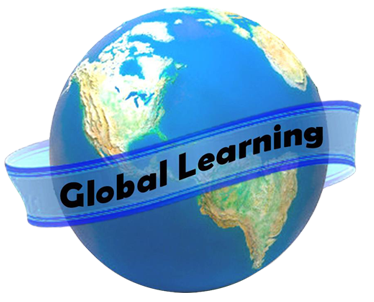 Each of the BLOSSOMS Blended TPL modules will also provide a video of the anchor lesson being taught by a master teacher in a live classroom, as well as video interviews with that master teacher and the students participating in the class. In addition to facilitator training for these workshops conducted by MIT BLOSSOMS, extensive guidance in written form will be provided for educators planning to facilitate a workshop via these online TPL modules. All teachers participating in these workshops will be required to bring a lesson of their own in order to spend time applying what they have learned to their own classroom teaching. For updates on this initiative, visit the MIT BLOSSOMS website or follow us on Facebook or Twitter. We have modernized our website to be mobile compatible with well-formatted content that is easy to scan. Our goal was user-friendly navigation with a simple and professional design. Check it out here! This lesson, entitled "Hanging by a Thread", was created by East Greenwich R.I. High School teacher, Francis Lenox. It is the first of five science domain, NGSS-compliant lessons developed specifically for BLOSSOMS’ new Blended Teacher Professional Learning Initiative. As part of that initiative, this lesson will demonstrate how to incorporate requirements of the Next Generation Science Standards (NGSS) into a physics lesson. During this lesson, students will: 1) apply their understanding of Newton’s Laws to predict the outcome of a demonstration; 2) develop a model to explain the cause and effect of two strings being pulled with unequal forces acting upon 2 identical masses; and 3) plan and conduct an investigation to find evidence to validate their claim. You can watch the lesson here. Emma Ferris is the creator of the very popular BLOSSOMS lesson, "An Introduction to the Physics of Sailing." The goal of this lesson is to explain how sailboats work by exploring basic physics principles. At the end of this lesson, students will be able to identify the complex of forces acting on a sailboat and explain how the combination of these forces results in the forward motion of a sailboat. Emma started sailing at a young age, has taught sailing for many years and sailed competitively in college at the United States Naval Academy. Her passion for sailing and the ocean led her to study Naval Architecture (ship design) as an undergraduate, and she went on to pursue a Masters in Mechanical Engineering at MIT, with a focus on Ocean Engineering. 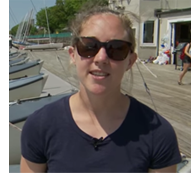 Emma created this lesson for BLOSSOMS while getting her masters at MIT, and it is filmed at the MIT Boathouse. She currently serves as an officer in the United States Navy. You can watch her lesson here.